The Birthday Cake. 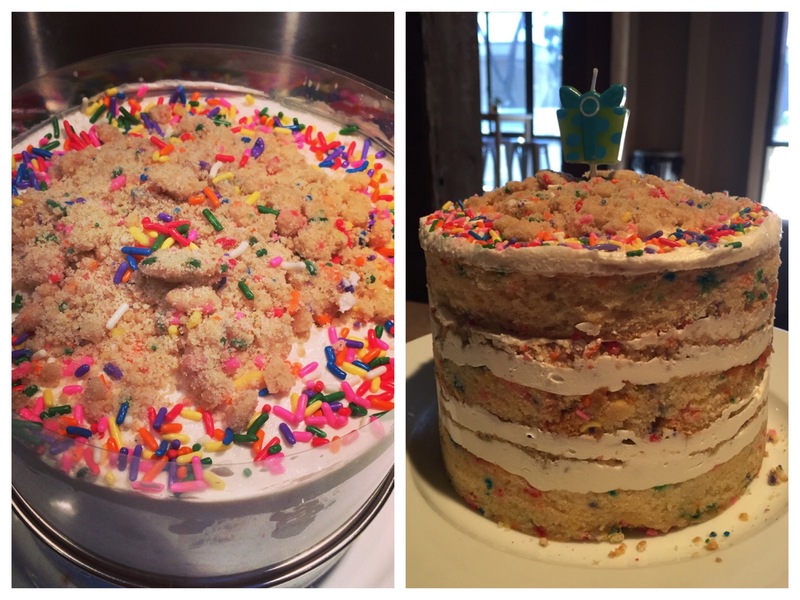 A layer of cake with sprinkles baked into it, topped with a white frosting (with sprinkles baked into), birthday cake crumb (with sprinkles baked into it), frosting, another layer of cake, frosting/crumb/frosting, cake, frosting, and then crumb/sprinkles decoration. Each cake layer also is brushed with a milk+vanilla “soak”, to add moisture to the cake. As far as white cakes go, this is a good one. The cake is tender and moist, but sturdy to work with. Because it’s a fairly straightforward cake, in terms of cake and components, my advice here is going to be pretty general and applicable to any of these layer cakes. So, you bake the cake in a quarter sheet pan and stamp out the layers (as shown in the Serious Eats slideshow). You get 2 circles and 2 almost-half circles. 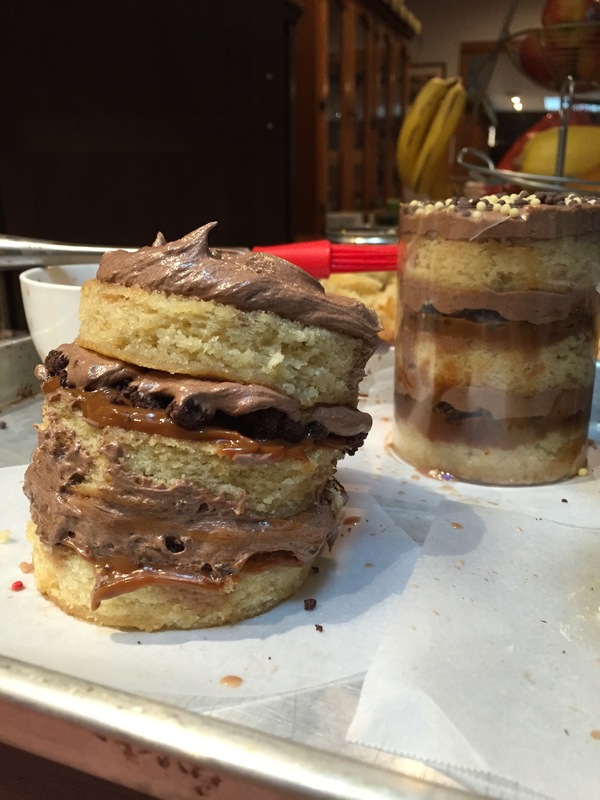 The half circles make the bottom layer (there’s a gap, but you fill the gap with some of the cake scraps and press it down). Sometimes I’ve seen people use the half circles as the second layer, but I think you’re able to press the scraps down better when it’s on the bottom. To assemble the cake, I lined the cake ring (the one you use for stamping out circles) with the acetate cake collar. I placed the first layer of cake in the ring and then taped the acetate together so I wasn’t accidentally taping the acetate collar too small. When I was finished with the cake, I’d put the whole thing in the freezer and after an hour, when the cake and frosting were firm, I’d slide the cake ring up and over the acetate, lightly cover the whole thing with plastic wrap (so the frosting didn’t absorb freezer odors), and then wash the cake ring for the next cake. I removed the plastic wrap and acetate while the cake was still frozen and let it defrost uncovered so the frosting wouldn’t smear or pull away. I found that a recipe of frosting is exactly enough for one cake. And, being an engineer, I weigh the frosting so I can make sure there’s enough for each layer. In the case of the birthday cake, you use 1/5 a recipe of frosting because it’s cake-frosting-crumb-frosting-cake-frosting-crumb-frosting-cake-frosting. Maybe you’re better at eyeballing 1/5 of a bowl of frosting, but I found that weighing it and then weighing out 1/5 made me less worried that I’d end up with a cake with no frosting on top. I never used all the crumb for one cake, which is fine. I ended up mixing and matching leftover crumb into other cakes, cookies, or cake truffles and I didn’t feel like the cakes didn’t have enough crumb in the layers. Because these are 6-inch cakes, they fit perfectly on a white dinner plate (or any dinner plate, I suppose). So, I assembled the cakes on a dinner plate, put them in the freezer to store, and left them on the plate to defrost and serve. It made things super easy and I didn’t have to worry about the cakes sliding around on a cardboard base. 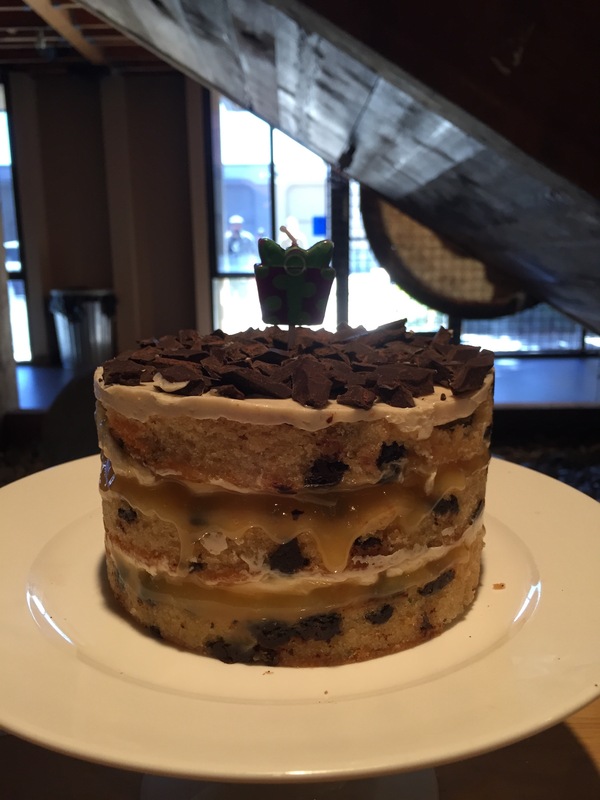 The Chocolate Chip Layer Cake. This cake ended up shorter than the others, and I think it’s because I forgot about the layer of chocolate crumb in between and also because the coffee frosting wasn’t as fluffy as the birthday cake frosting. But, it was the most delicious cake and I’d gladly eat it again. The recipe calls for mini chocolate chips, but I had bags of chocolate chunks (and couldn’t find mini chips at the grocery store?) and it all worked out, so I would say that anything from mini to normal to chunks of chocolate will work here. Obviously, with mini chips you’ll get a better distribution of chocolate in each cake bite. In order to make things easier on myself, I used a jar of lemon curd instead of making the one in the book. Because the one in the book uses a bit of gelatin for structure, I’m wondering if that would have also helped with my cake height. The Trader Joe’s lemon curd got a little soft at room temperature. I used just under 1 jar for this cake, with enough lemon curd leftover to spread on a biscuit the next morning for breakfast. The birthday cake recipe has you sprinkle extra sprinkles on the cake batter before baking. I thought it would also work for the chocolate chips, but I recommend against it. The cake batter ended up rising and getting poofy, which caused dimples everywhere it had to bake around a chocolate chunk. It didn’t affect anything tastewise or visually, but it also didn’t add anything, so I wouldn’t bother (and I haven’t, in the subsequent time I made the cake). The Chocolate Malt Layer Cake. 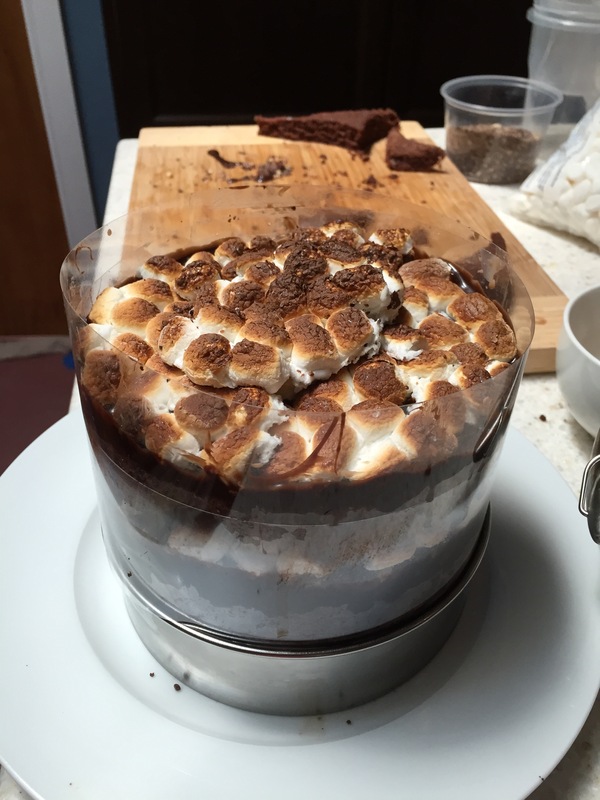 Everyone called this the S’mores Cake because of the marshmallows, but it doesn’t really have that graham cracker flavor to it. You could make it a S’mores Cake by using graham cracker crumb, or a different cake base, but this cake is for chocolate lovers. Chocolate lovers with a sweet tooth. The cake itself has fudge sauce as an ingredient and it’s a firm chocolate cake. Of all the cakes, this was my least favorite to eat on its own, but that also didn’t stop me from finishing all the cake scraps. The cake uses fudge sauce as an ingredient (different from the malted fudge sauce it uses as a layer). I had a jar of Trader Joe’s chocolate sauce in the fridge, so I used a few tablespoons of that instead of making it from scratch. I was actually going to use a jar of sauce for the layers, but decided to make it since I had already bought the Ovaltine. The point I’m trying to make is, the malted fudge sauce recipe was enough for the cake layers and leftovers, so if you make the sauce, do it before the cake and just use that to put into the cake batter. The charred marshmallows were the stickiest and trickiest to work with. I charred them on a Silpat and threw them in the freezer until they were cold and hard, and the bottom of the marshmallows still stuck to the Silpat when I tried to pull them off. I’m thinking the marshmallow bottoms got too melty and sticky, but I’m not sure how I’d fix that. In any case, after I pulled enough off to cover a layer (keeping your hands wet helped immensely with this task), I’d throw the pan back in the freezer while working on the next layer to keep the marshmallows from getting too sticky. Tricky to work with, but if you like toasted marshmallows, you’ll love this part of the cake. Because of the sticky marshmallow layer, slicing the cake was a little challenging, too. I was able to wet the knife in the beginning, which helped, but in the end I was basically hacking off chunks and scooping it onto a plate. No less delicious, just not as neat as the other cakes. After I got a Vitamix, I stopped buying powdered sugar. I just take regular sugar and blitz it on high until it’s powdery (it take a minute or so). For the recipes, though, I wasn’t sure how to measure out pre-powdered sugar. And then I figured out I could weigh the granulated sugar and then powder it, since the sugar wasn’t changing, just the volume. You may have already figured that out, but I was pretty proud of that lightbulb moment. I made the banana layer cake from the book and it was delicious, but I couldn’t get the banana pudding to set up, so it all oozed out and I ended up scraping it into a bowl and calling it a trifle. I also thought the banana pudding was way too sweet, but I think that’s because it’s meant as more of a frosting, instead of a stand-alone pudding. In any case, if you know where I went wrong, let me know! After the birthday party, I made a few more cakes but turned them into mini 3-inch and 4-inch cakes so I could take them to a friend’s house and we could eat an entire cake but not go into a sugar coma. I cut a cake collar in half to fit the smaller ring but didn’t feel like doing it for the third mini cake,so I thought I would freehand it. What you see above is the result – a tispy cake that eventually ended up sliding over on itself on my counter. I smushed it all back into a tower and then frosted the sides and then ate it quickly so no one would see the ugly cake and call it a lesson learned. When making “naked” cakes, the acetate really helps hold the cake layers together while the refrigeration (or freezing) sets it all up so it won’t collapse when sitting at room temperature. Use the acetate cake collars. Then, once again I got lazy while making a mini cake and thought I would just stack the layers in the cake ring, freeze the cake and slide the cake out of the ring when it was solid. I figured it would work because I was using a pretty stiff buttercream, so the cake wouldn’t fall over. Well, the cake didn’t fall over, but the cake was pretty firmly stuck to the cake ring and I couldn’t get it out. We ended up eating the top layers of the cake and then scooping the bottom layer out. So, again, use the acetate cake collars! The crumb recipes freeze really well, so if you’re making a crumb recipe (either the birthday cake or chocolate), I’d make a double batch and freeze half for some later use. The birthday crumb is used in the confetti cookie recipe and there’s a chocolate cookie recipe, too, that turns out crispy-chewy cookies. If you do make the confetti cookies, know that they spread a lot. On a half sheet pan, I’d fit 4 cookies max to make sure they don’t spread into each other. The unbaked cookies also freeze really well and take only a couple extra minutes of baking. I had a lot of fun making these cakes and setting them out for display. To me, they are way easier than frosting and decorating a typical cake since you don’t have to worry about the sides. I had numerous people ask me where I bought the cakes, which made me feel pretty proud. And, even after baking various cakes over the course of a month, I can honestly say I’m still not sick of eating cake! This entry was posted in food, recipes and tagged birthday cake, chocolate cake, chocolate chip cake, milk bar, tips and tricks. Bookmark the permalink. I love seeing all the shortcuts you made and the result of each. I don’t think I would go through the hassle of making lemon curd from scratch either even with the oozing. I wonder if the mini cakes (which I love and is a millions times better than cupcakes), would work with skewers running through the center to keep it all together? I didn’t even think of skewers for the mini cakes! You could make 2-layer mini cakes that would be perfect for a single serving (and better proportions of frosting than a cupcake) and decorate the skewers on top! Having made so many of these cakes now, I can say that having the crumb made and in the freezer, the cake making part is actually not that hard. And so worth it! How did you keep the acetate rings together? With tape? I taped the ends together – I use either Frog tape or blue painter’s tape a lot in the kitchen. Invaluable for labeling things, taping things shut, and it’s easy to remove! I get 8-10 servings from one cake. You could even stretch it further with skinnier slices. They’re pretty rich cakes, so a little goes a long way.